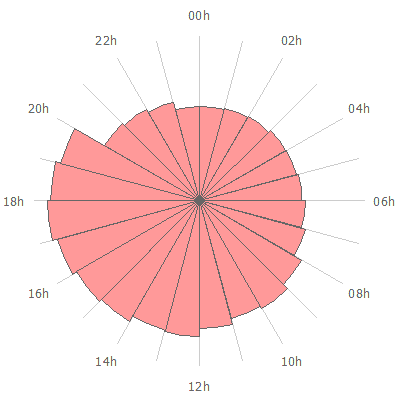 Jon Peltier has written about graphs based on hours of the day (and chosen the perfect title, so I have to make do with second best), with examples attempting to show the day and night cycles together intuitively. A you point out, here in the States, 24 hour clocks are uncommon and unfamiliar. We can use 24-hour format time in digital format, but I fear that using the graphical equivalent would result in more confusion than understanding. Your version of a radial chart also seems to emphasize area, and I would be reluctant to use it to compare two series, given the confusion engendered by data which is encoded by area.